Find hotel near Al Tannoura Egyptian Heri ..
Watch the vigorous and soulful dance of the performers and sway to the melodious voices of these talented people while enjoying a show at the Al-Tannoura Egyptian Heritage Dance Troupe. 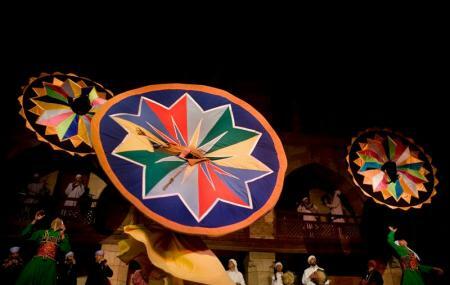 The heritage dance troupe is Egypt’s only Sufi dance troupe. The show is a true delight and should be attended at least once when in Cairo. The Al-Tannoura Egyptian Heritage Dance Troupe is a true charm in Cairo and is highly recommended. Arrive an hour in advance for a secure seat. Ticket prices will depend on performances. Performances usually start at 8 pm on Mondays,Wednesdays and Saturdays. How popular is Al Tannoura Egyptian Heritage Dance Troupe? People normally club together Cave Church and Cairo Tower while planning their visit to Al Tannoura Egyptian Heritage Dance Troupe.